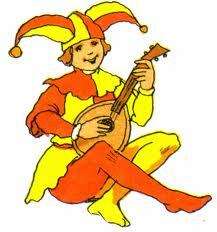 A Fool for an April Fool! That's what today is -- April Fool's Day. As a child, I thought it was a day for children to play tricks on each other and on adults -- who were always so gullible to any pranks or jokes pulled on April 1! But it isn't really and reading on the internet, I've come across a few reasons as to why it's April Fool's -- but nothing really as to why the pranks. It dates back to when the calendar changed -- for April 1 was the first day of the New Year . . . but then when the calendar changed January 1 became the first day of the New Year. Without internet or cell phones or even television or newspapers, many people did not realize that the date of New Year had changed and those in the know called those who didn't "fools" -- on April 1! It sounds like a good explanation to me! I still enjoy playing pranks -- "your slip is showing" (but we don't wear slips any more do we?) or "you have a tag out" (but so many articles of clothing have the tag on the outside) but there are other little tricks that we can still play on those near and dear and those who are not so much! 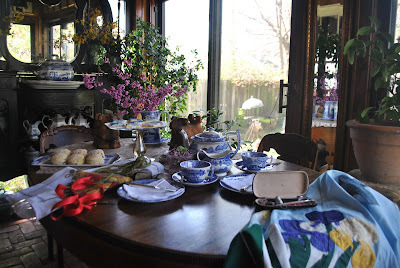 I thought of playing with my header today -- perhaps picturing a mansion instead of my dear little cottage but alas, time got the better of me and I came to my senses and decided that I would not "trick" my readers! But instead, share what is the traditional April 1 dessert at Linderhof . . .
A fool! Strawberry because neither gooseberries nor rhubarb are in the market here on April 1. 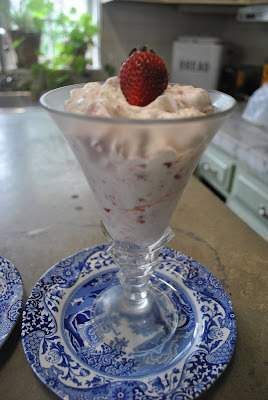 Strawberries do make a good fool but I like the tartness better of gooseberry or rhubarb! They're easy to make and quite showy in a parfait glass. And good to the last "lick" of the dish! But what isn't good when it's made of cream and a bit of sugar and strawberries? Our dessert for April 1. This year eaten after a meal of lamb shanks and roasted potatoes. Almost an English Sunday Roast! I so miss those! But the fool has it's roots in England and so not only a fitting dessert for April Fool's Day but also a fitting dessert for an English Sunday Roast! The recipe is simple and actually can be made with any fresh fruit you'd like although rhubarb, gooseberry and strawberry seem to be the fruit in most recipes I've found. But I'm sure a blackberry fool would not be a bad thing! Hull strawberries, then wash them and chop into 1/4 inch thick pieces. Toss with half the sugar and wit 10 minutes, stirring occasionally, until they give up their juices. Place half the strawberries and all the juice in a blender and puree. Pour puree back in bowl with chopped strawberries. Whip the cream with remaining sugar and vanilla until cream is stiff and holds peaks easily. Fold berries and cream together and serve immediately or refrigerate for up to two hours. 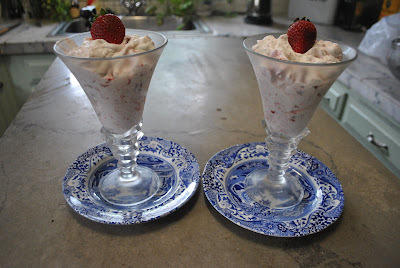 NOTE: I like to serve fools in parfait glasses for they are a pretty dessert. For a strawberry fool, I always save enough strawberries to top each fool parfait with a fresh berry. For other fools, I save enough of the pureed mixture to top the fool. My brother came for the weekend -- Saturday afternoon. Sunday morning we skipped church and had a leisurely breakfast on the breakfast porch. My beloved blue and white, of course. All Asiatic Pheasant in different patterns and different shades of blue because they are from different manufactures. But they're all English. 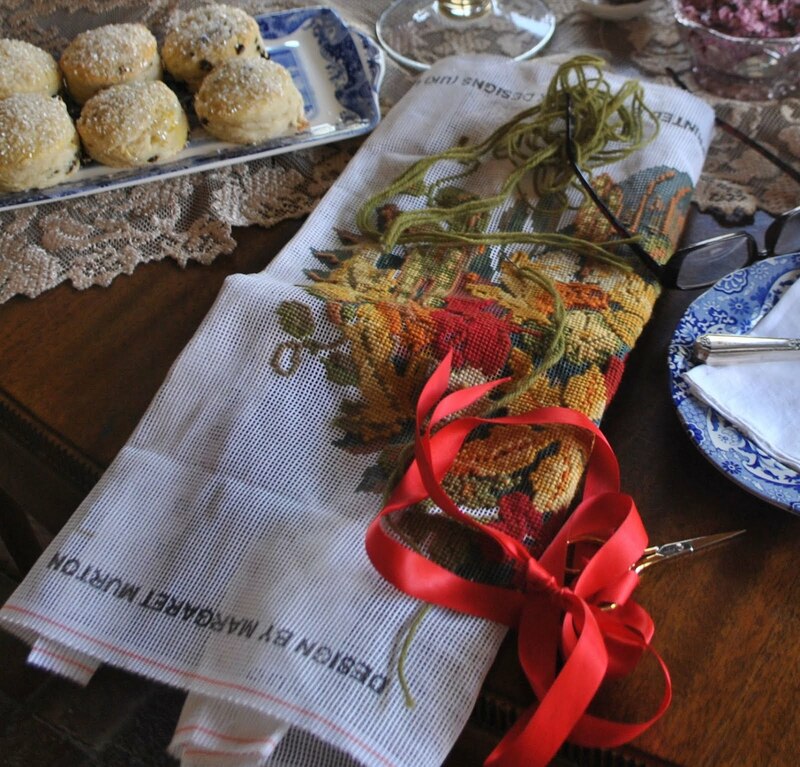 White linen napkins, Johnson Brothers, plates, Crown Staffordshire bread plates with bone handled bread knife. And for me, Burleigh cup and saucer. 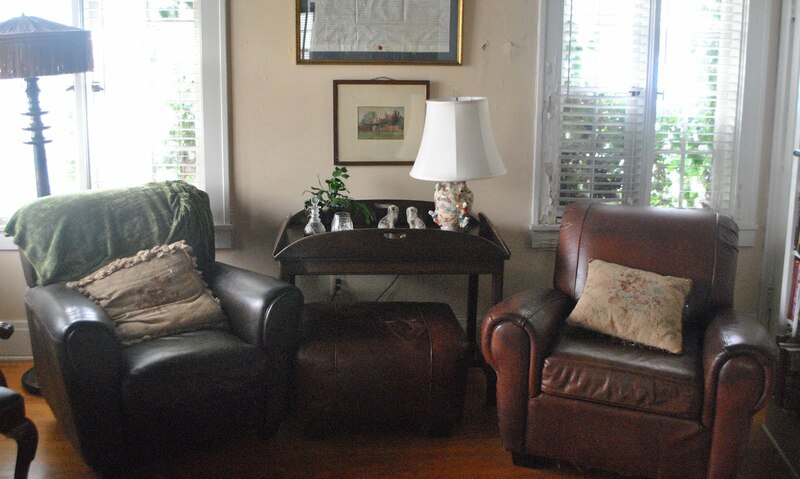 The coffee mugs are in the living room with the guys who are reading the Sunday papers and watching television. Toast served in a silver "toast cooler" (my husband's name for the toast rack), marmalade in the marmalade jar and a silver pearl handled jam spoon for the marmalade. My utilitarian every day teapot for my tea. 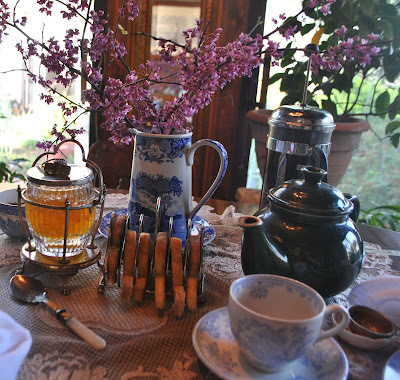 (While the guys second pot of coffee is in the French press or cafeteria (as the Brits call it) behind the teapot. 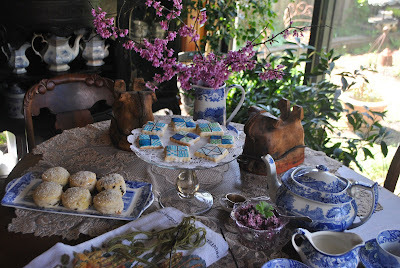 And a few branches of the blooming red bud tree in a blue and white pitcher for a centerpiece. This spring, we've been sticking whatever is blooming in that pitcher. 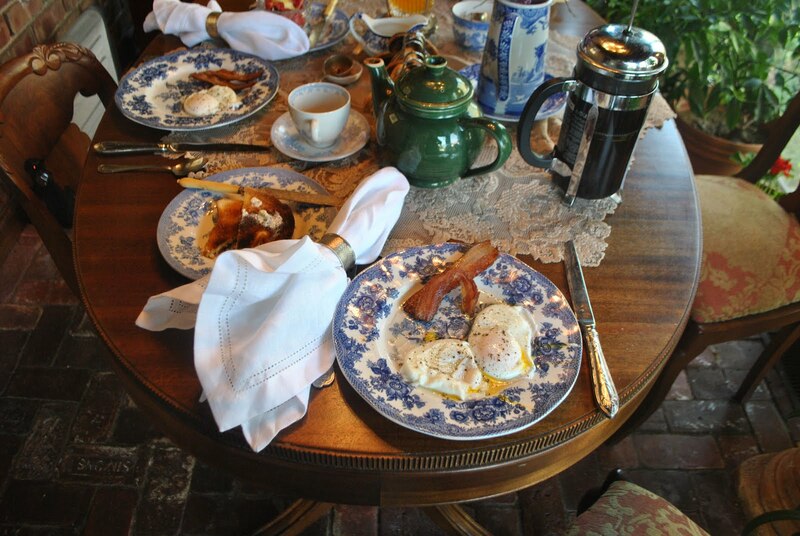 It seems perfect for the breakfast porch table and we like the "revolving" flowers. My brother and I like fruit for breakfast -- husband not so much and sliced strawberries topped with the lemon curd I had made the day before is a great way to start a breakfast. It was a leisurely breakfast as Sunday breakfasts should be -- filled with talk and we emptied both coffee and tea pots before we left the table. 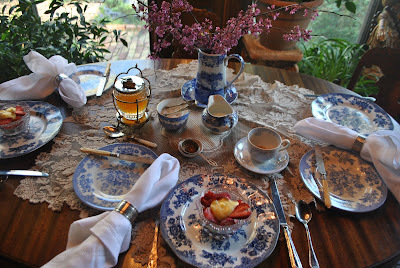 It's Thursday and I'm sharing breakfast for three with Susan at Between Naps On the Porch for Tablescape Thursday. I've never cared for the color lilac nor the color purple for that matter. I've seen bloggers post about amethyst glassware but it, too, leaves me cold. Eggplant is a good vegetable but not a good color. There wasn't any purple or lavender in any of the houses in which I grew up so it can't be that I had an overdose of purple/lavender when I was a child, scaring me for life. It's just not a color I care for . . . But, I do adore . . .
the lilac flower. 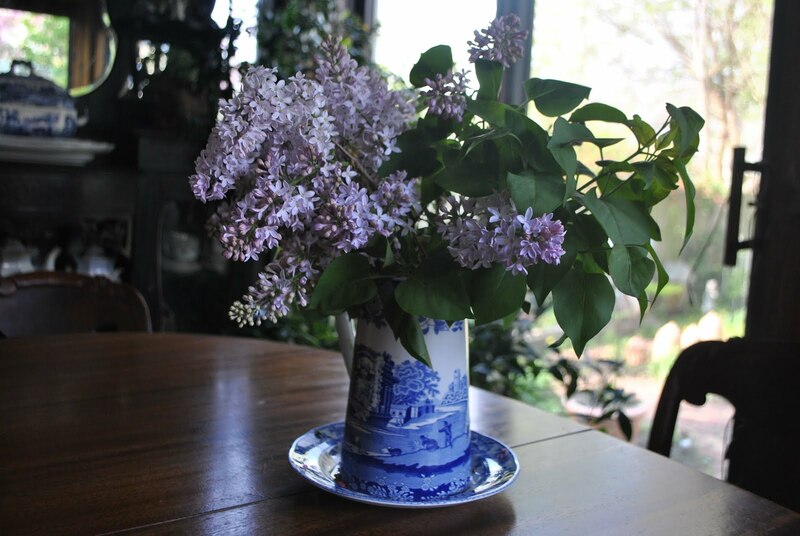 Lilacs grow easily on the prairie. And driving in the country, you'll often find them in yards of abandoned farmhouses. 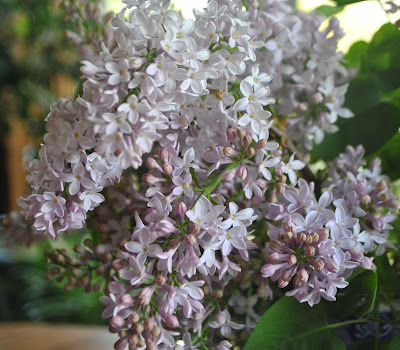 Every grandmother had a lilac! And the fragrance . . . is heavenly. Which is why during lilacs short bloom time, I pick armfuls to bring inside. Some for the Waterford vase on the sideboard. The Easter egg tree has pride of place on the dining room table so alas, any flowers are on the sideboard. 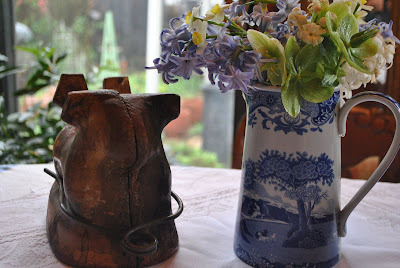 And a big bouquet in a blue and white pitcher on the breakfast porch table. The jasmine is blooming as well and between the two the aroma is almost overpowering in that room! Linderhof's lilacs are old fashioned lilacs. Not bought but dug up from one of those abandoned farmhouses (shhh -- don't tell) 20 plus years ago. Three plants. Two between the drives and one by the dining room window. And when my mother passed away, 13 years ago, I dug up a plant from the one in her yard. 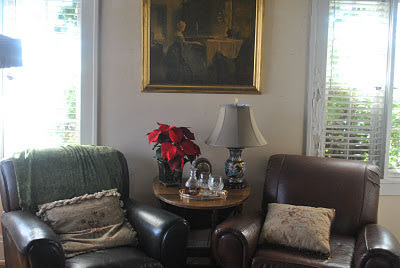 That plant has a history -- for it came from a plant that came from a plant that was outside the bedroom in the apartment that my parents lived in for the first 9 years of their married life. 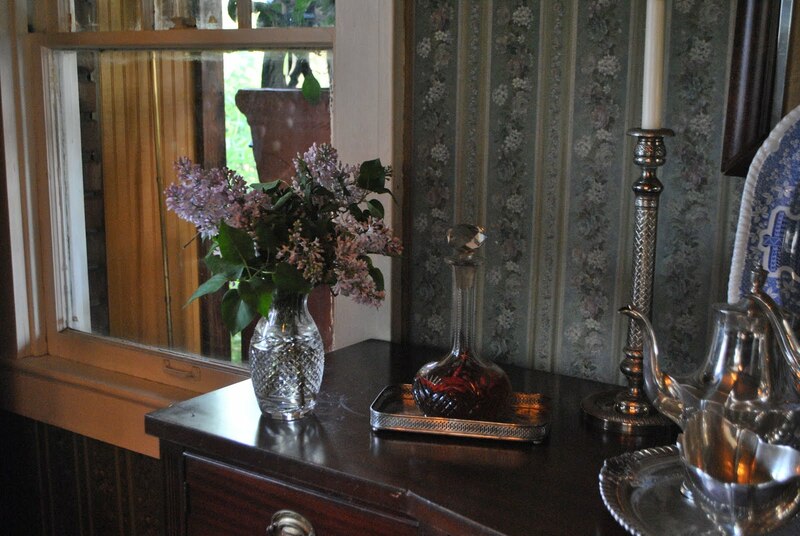 Mother loved lilacs as well and when she moved to the big house, a start of that lilac came with her. 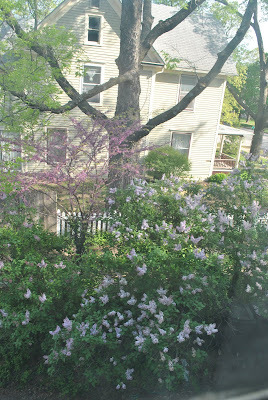 When we moved to the suburbs, a start of that lilac came with her. And when she passed away and we had sold the house, I dug up a start from that lilac. The interesting thing is that the next year there were two blooms on that plant. I've never had a lilac bloom the year after planting. I think it was a message from mother! I've been going up and down the stairs a lot the last few days for . . . This is the view from the upstairs window. The lilacs in full bloom! I've never seen so many blossoms on the lilacs in all the years I've had them. And when one goes outside, the aroma is heady -- the fragrance is almost overpowering! We don't get many Lilac Years on the prairie for often once the buds are set a cold front moves in -- some survive but not all and even when we do have blooms, we often get a late frost. Sigh -- lilac years are rare, rare indeed! I love my lilacs and really wish I had room for more. For during that magical week in the Spring, there isn't a better plant on earth! Joyce's sewing kit with scissors, seam ripper, needles, thread and a wonderful antique sterling thimble -- that's a family piece! 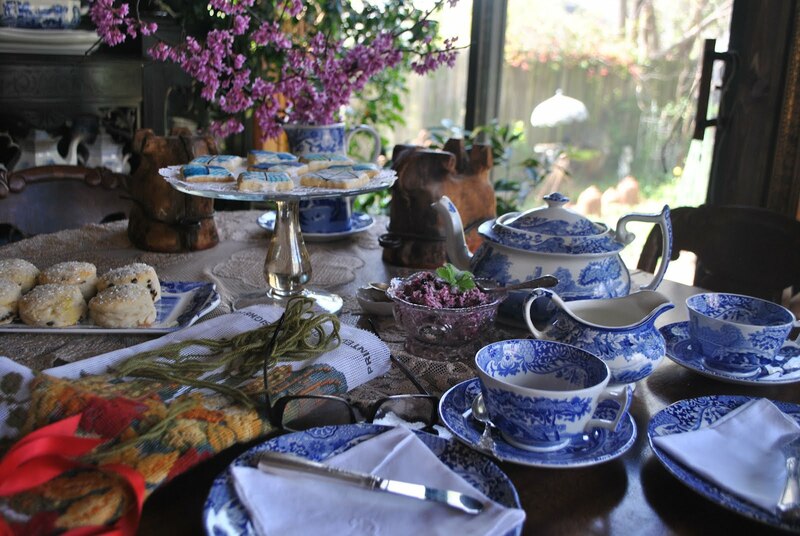 When my grandmother and her friends got together for a Quilting Bee, she called the afternoon nosh of tea and her homemade cookies a "Thimble Tea". Last weekend our town had their every other year "Voices From the Quilts" event at our historic fort. And even though I don't quilt, I found the speakers interesting and the quilts fascinating. 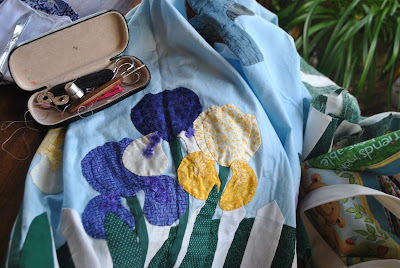 I do have friends that quilt and I decided to resurrect Grandmother's "Thimble Tea". Friend Joyce (and a Lunch Buncher) is a quilter -- well, she doesn't quilt but she loves to piece. I told her to bring her latest project and we'd have some companionable time with our needlework and a pot of tea and a nosh. The table on the breakfast porch set for tea . . . so we could sip and nibble while we sewed. Joyce is working on this beautiful appliqué quilt of iris -- which includes fuzzy little beards like real iris have! They were so pretty! And I've got my needlepoint. To be a cushion for the big beige chair in the living room when it is done! Started on our January cruise through the Panama Canal. 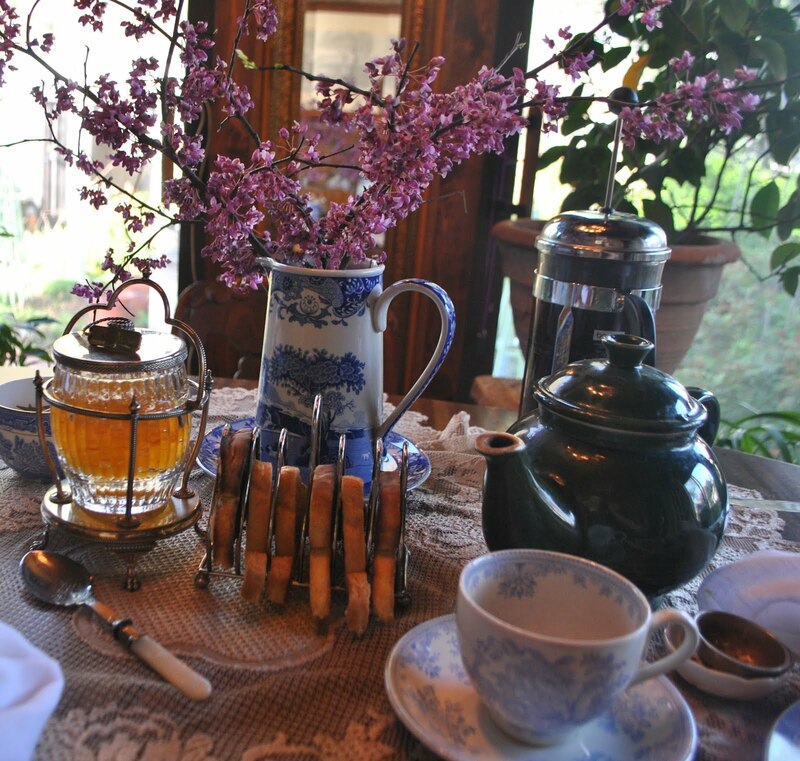 Not just a nosh, but more of a full blown afternoon tea . 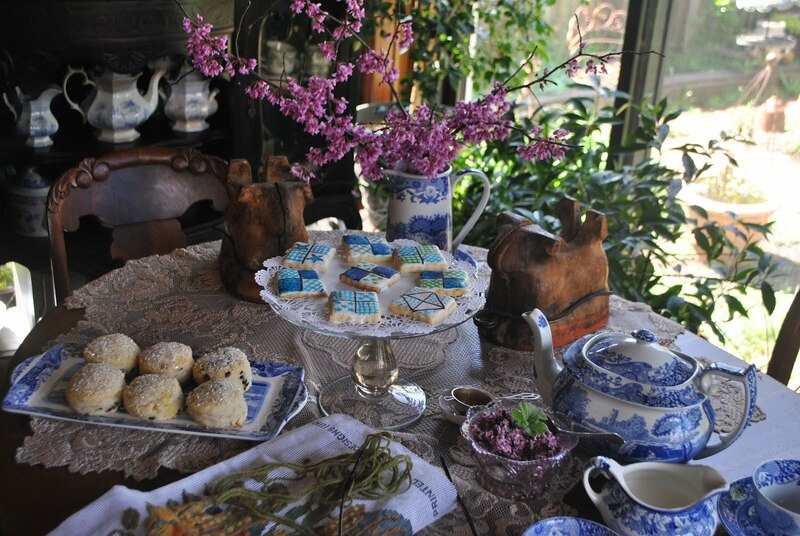 . .
With scones. 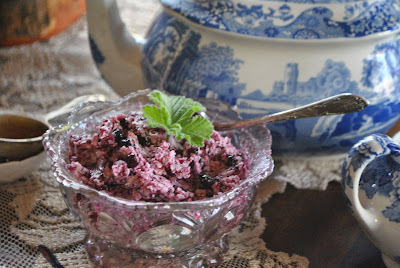 Fruited yogurt ones which are so simple to make and have a nice almost sourdough tang. Blueberry Butter. To slather on the scones. It's easy to make and makes a scone special! Blue and White Quilt Cookies. I nabbed a few from the 5 dozen that I made for the quilt events last weekend. 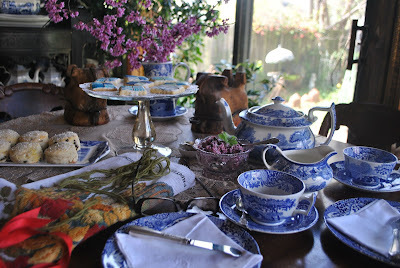 And of course, it was a blue and white tea with my Spode Blue Italian cups, saucers, teapot and tea plates. 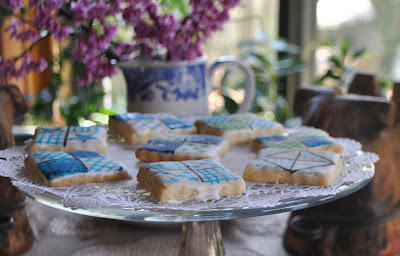 It had to be blue and white since the quilt cookies were, after all! The recipes are so simple -- the scones can be made up almost as quick as it takes a guest to walk from car to door! The blueberry butter is as simple as mixing room temperature butter, a smidge of salt and some blueberry preserves! Sift the flour and salt together into a bowl and create a well in the center. Add the yogurt and mix into the flour until it resembles a crumbly dough. Turn out onto a floured surface, pat together into a disc and pat out to about 1 inch thick. Cut out rounds with cutter or the top of a glass dipped in flour. Place the rounds on a nonstick cookie sheet. Bake at 450 for 10 to 12 minutes or until browned. NOTE: I added about 1/2 cup of currants to the dough before I turned it out. I also brushed the top of the scones with egg wash before I put them into the oven. 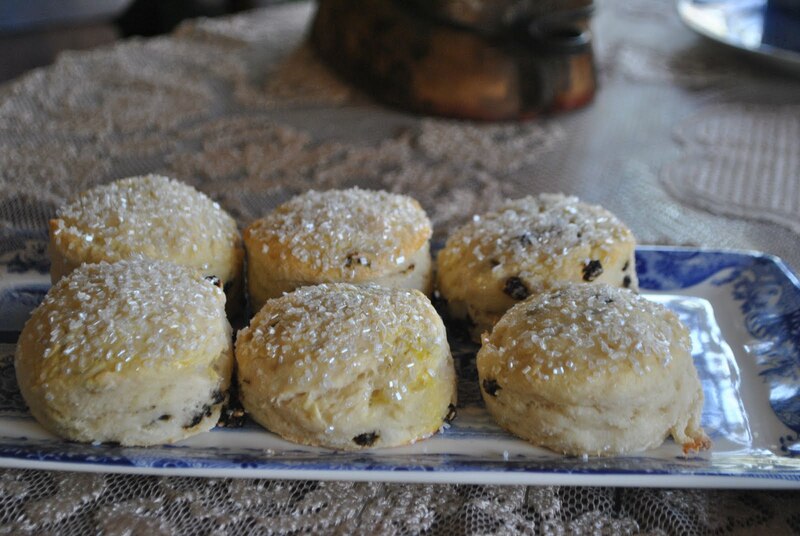 Since we spent last Spring in England, I prefer my scones their way -- round. Scones here are usually made into triangles. You can make yours in either shape! Combine the butter, preserves and salt in the bowl of an electric mixer fitted with a paddle attachment. Serve at room temperature. 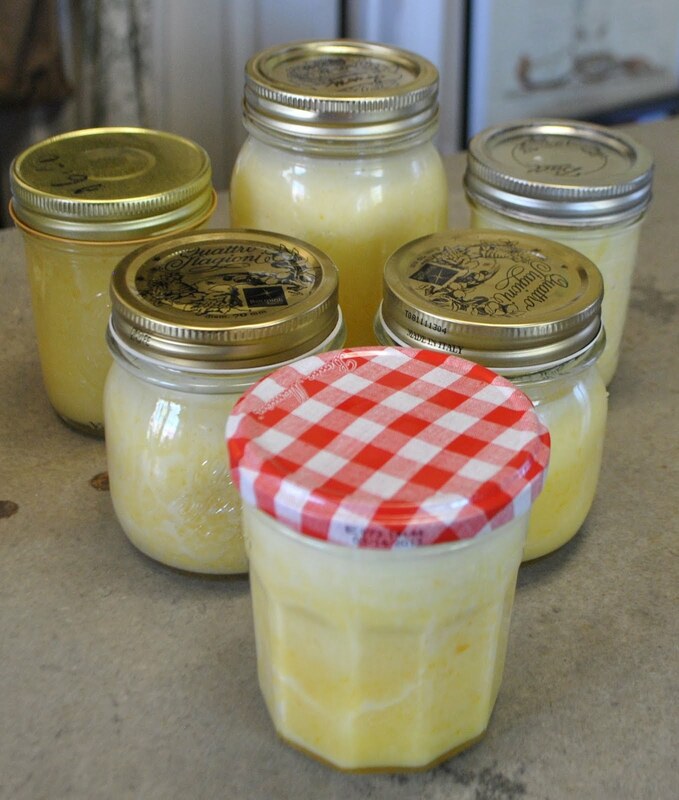 You can make butter with any type of jam that you like -- strawberry, raspberry, apricot. It's as good on biscuits, toast or English muffins as it is on scones! Lights and Lemons . . . and Quilts! Lights -- or rather lamps -- in the dining room -- on the mantle. A revolving door of them, it seems . 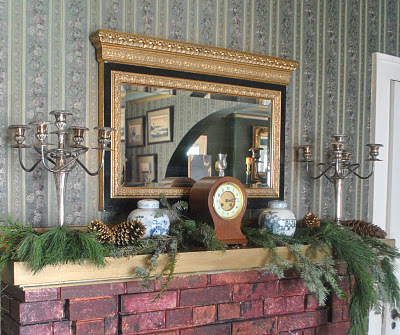 . .
For in December the mantle looked like this -- with silver candlesticks because I never could find the perfect lamps for this spot! And then, in December, I found . . . These lamps and I thought they were perfect. They went well with the sconces in the living room and were of the same era, I felt, of the house . . . . I moved them to my dressing table where they do look smashing. 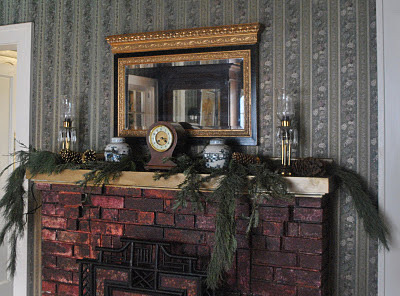 More smashing, I think, than on the mantle and the lamps on the dressing table do match the sconces above the fireplace in the master bedroom. I moved them because . . . I bought these lamps! 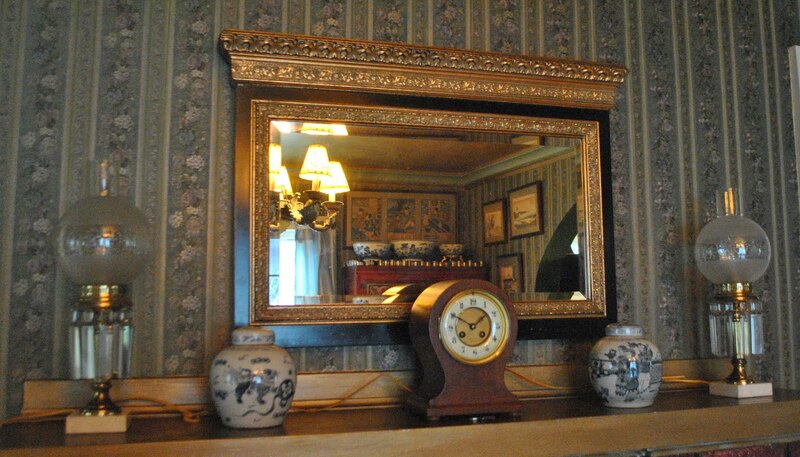 Which, although they don't really match the sconces in the living room . . .
Are a much better scale than the other lamps. I have always adored the type of prisms that hang from these lamps and coveted them . . . alas, never owning a lamp with these type of prisms. I think -- it is a win/win situation! Each lamp is perfect in it's new location! I am one happy person! And this weekend I was busy . . . for we had our every other year "Voices From the Quilts" event here in my little town. I volunteered, not only to work a shift for the Shop Hop but to make cookies to sell at the Shop Hop. Little quilt squares. No two are alike! Five dozen individually painted. It was a labor of love! And then on Saturday . . .
Friends Anne and Tim brought us a sack containing lemons. Real California lemons which just arrived sent by Tim's brother Jon. Sweet Anne brought them to me. And what did I do with them? Make curd, of course! Anne loves curd and I've often gifted her with a jar. 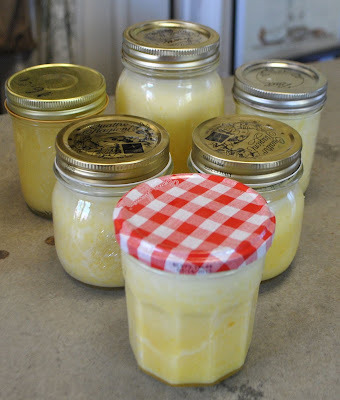 She specifically said that if I made curd, a jar was not to come to her! But, of course, one will! I love lemon curd spooned over breakfast berries, with afternoon tea scones and it's even good to fill little tarts for a company tea. And a jar does make a nice gift, if needed! It is Monday and I'm sharing my lamps with Susan at Between Naps On The Porch for Met Monday and Stone Gable for What's On the Menu Monday. How can you not love a dessert with the name of "Lemon Dainty"? I found it in an old Palo Alto Junior League Cookbook (if you call 1984 old). 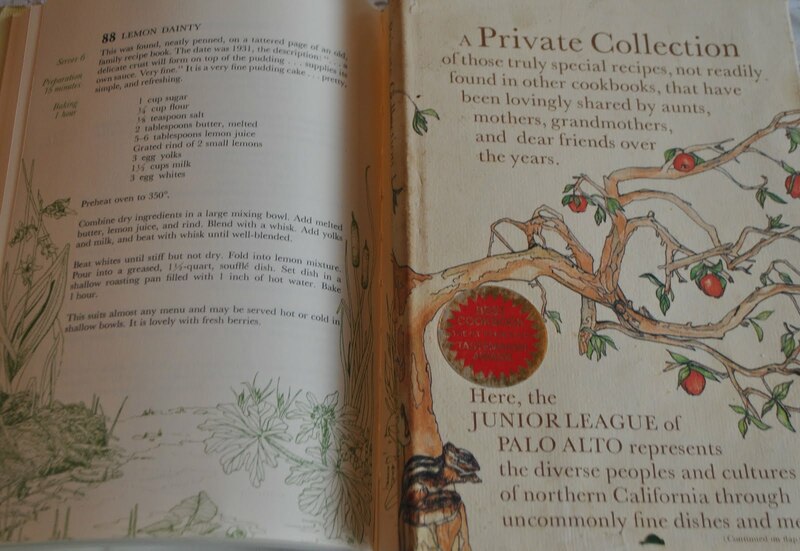 It's the second volume that that Junior League published -- both are thin volumes and have some good recipes in them. I adored the books (for I have both Volumes 1 and 2) but had never cooked from them although I had read them a lot. 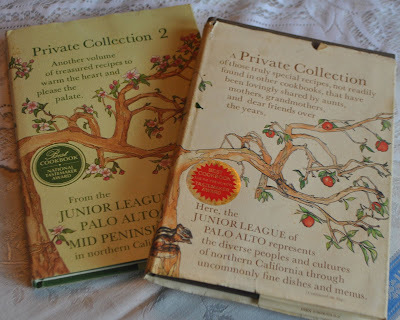 And with the Lunch Bunch coming last Tuesday, I decided a lemon dessert would be perfect and I also decided that my whole menu would come from the pages of these two books. And in the dessert section of No. 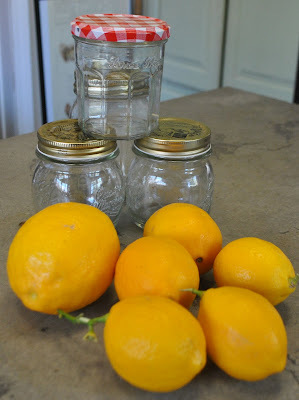 2 was a recipe for Lemon Dainty -- with the notation: "This was found, neatly penned, on a tattered page of an old, family recipe book. The date was 1931, the description: "A delicate crust will form on top of the pudding . . . supplies its own sauce. try fine". 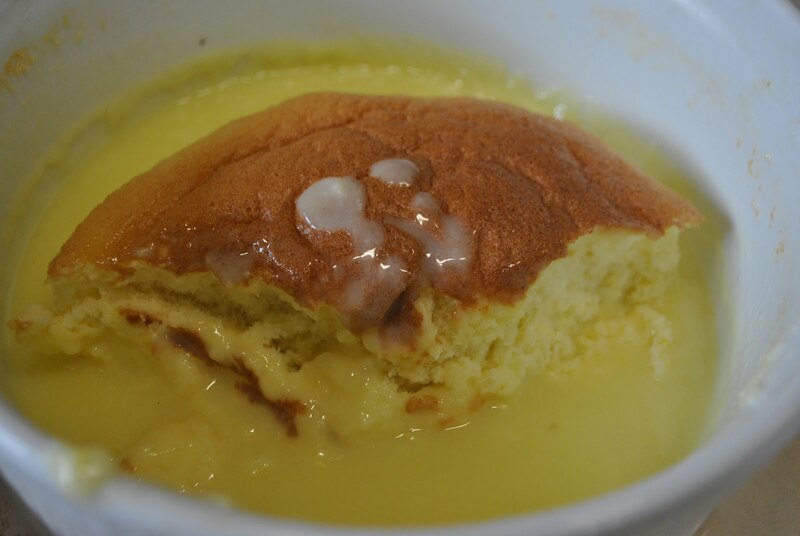 It is a very fine pudding cake . . . pretty, simple and refreshing." The cookbook is right -- it is very fine. And it does have a delicate crust. Baked in a soufflé dish, it's a pretty dessert. And it looks yummy on the plate surrounded by it's sauce and garnished with a few fresh blackberries. And it made plenty -- three nice servings and the rest "leftover". 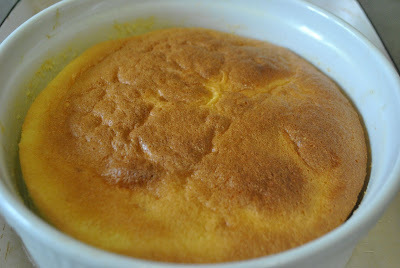 Next time, however, I think, I will bake it in individual soufflé dishes. I think that would make for a prettier presentation especially with a shower of powdered sugar! And besides being a good dessert, it is an easy dessert! Combine dry ingredients in a large mixing bowl. Add melted butter, lemon juice and rind. Blend with a whisk. Add yolks and milk and beat with whisk until well-blended. 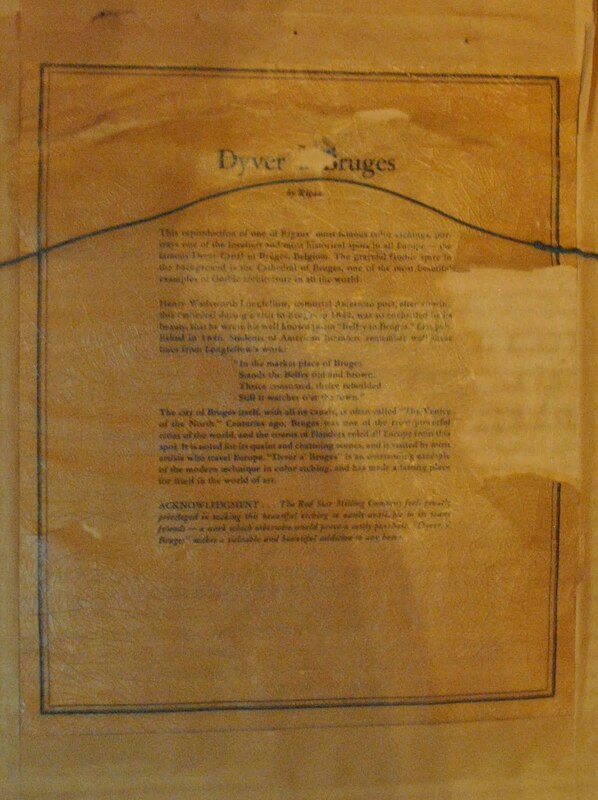 Beat whites until stiff but not dry. Fold into lemon mixture. Pour into a greased 1 1/2 quart soufflé dish. Set dish in a shallow roasting pan filled with 1 inch of hot water. Bake 1 hour. From the cookbook: This suits almost any menu and my be served hot or cold in shallow bowls. It is lovely with fresh berries. The Lunch Bunch -- three dear friends who come to lunch at Linderhof once a month. I have fun deciding upon a type of menu, selecting recipes, putting together a centerpiece, and selecting dishes and linens! March has been really warm on the prairie an so I decided on a ladies lunch of soup and chicken salad. A perfect meal for an 80 degree day! But the day turned out to be a 50 degree day!!!! 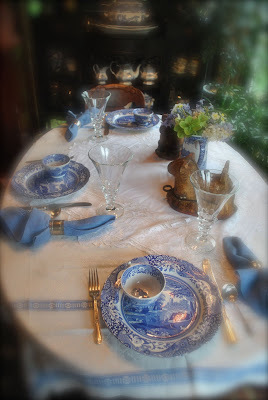 A gift was the blue and white damask tablecloth. It's old with a lovely feel that only well loved and well laundered damask has. The table set with my blue and white, of course, a blue linen napkin that's getting a lovely feel for they've been used and laundered a lot since I've gotten them, and Husband Jim's grandmother's cutlery. It's Lent and the French lamb molds are on the table during Lent -- and with a blue and white table, blue and white flowers in a blue and white "vase" (a Spode Blue Italian pitcher). And every time we have company we always place a menu at each place. Often, when picking up, after the company has left, the menus are gone -- souvenirs of a fun afternoon. 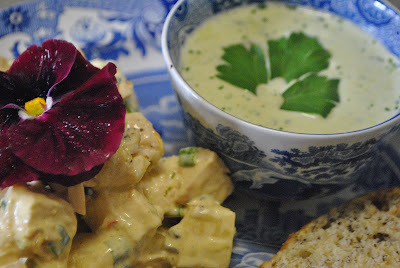 And lunch . . . .
Chutney chicken salad (decorated with a pansy), California asparagus soup (decorated with a parsley leaf because there is parsley in the soup), and a slice of banana bread. Lemon Dainty for dessert. 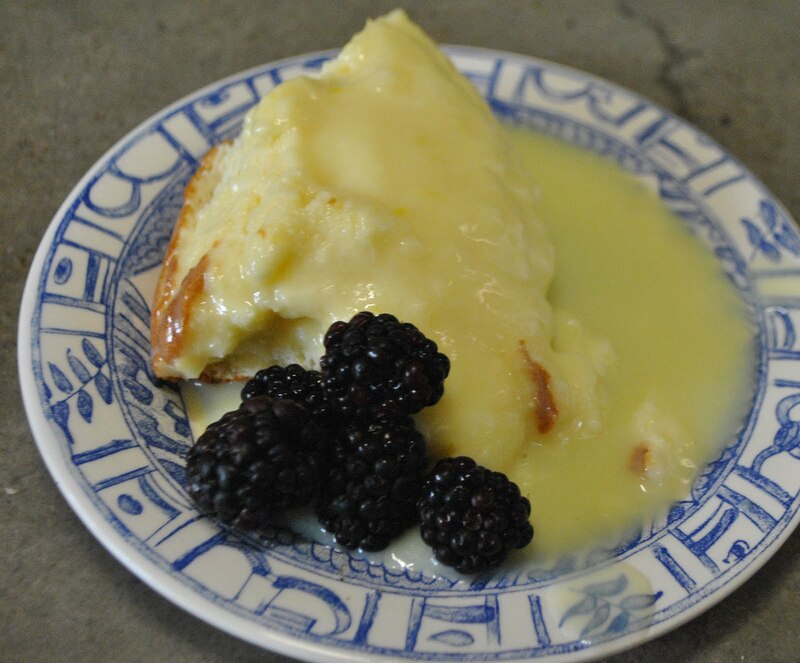 An old 1931 recipe that reminded me of a pudding cake except it was more like an angel food and the sauce that was made while the cake baked was wonderful. A garnish of a few fresh blackberries. My search for a menu and recipes for this lunch took me to these two cookbooks. I've had them for a long long time -- one is copyrighted 1980 and the other 1984. I got the first one on a trip to California and I'm not sure how I acquired the second but I was so fond of the first that I had to have the second! And I did like them. I did read them. I looked at the recipes. But I never made anything out of them! I decided that the March lunch would rectify that and so I composed the menu based on the recipes in the book and took the suggestion of serving banana bread with the chicken salad -- which was brilliant! Everyone liked the chicken salad (for they all adore curry) and were fond of the soup and thought the banana bread was perfect! But the star of the show was the Lemon Dainty. Only next time, I think I will make it in individual ramekins -- it will make for a prettier presentation I think. 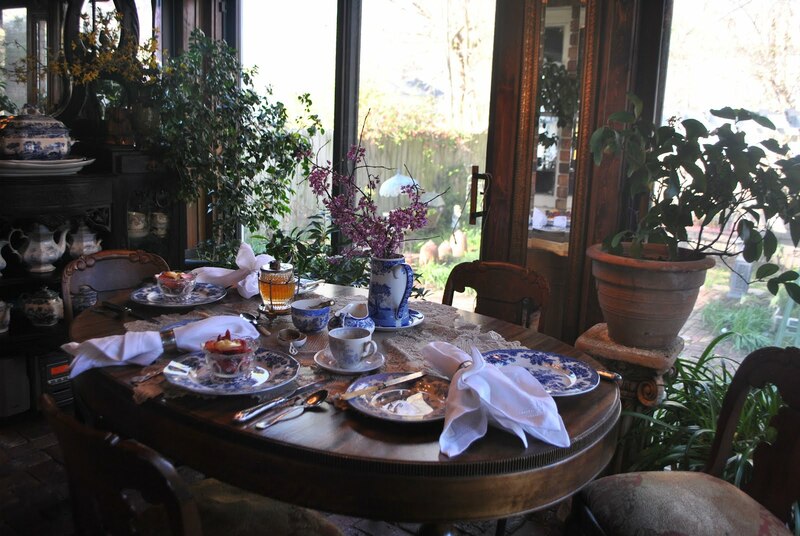 We sit and chat after lunch with perhaps another cup of coffee or two! It's a leisurely lunch and no one is in a hurry to get back to the "real world"! But as they leave, we know that there will be a "next month"! Memories In a Frame . . .
As a single career girl, I took a trip to the Bahamas in the late 60s. My first and for a long time, my only trip outside of the United States. In 1987, Husband Jim decided that we need to take a trip to England. He had not been there -- and of course, neither had I. So plans were made, tickets bought, car rented and off we went. Our vacation took us to Dover and Jim had the brilliant idea that we need to go to Europe. We did not have a Visa for France so that was out. The Netherlands were too far. That left Belgium. So we bought tickets on a ferry and sailed for Zeebruges. Once there, we got on a train which took us to Bruges. 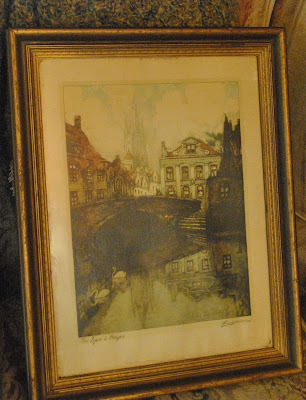 Bruges -- a true charming European city! I was enchanted. I adored England then (and still do) but this European city was so different than the villages of England. We spent the day, had a meal (and our first experience at trying to order off of a menu which was not printed in English (we ended up both getting fromage omelet because I knew that was a cheese omelet) and had a grand time visiting some second hand stores and antique shops. 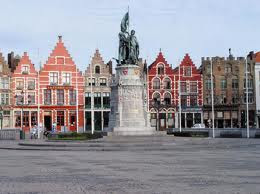 Lace and chocolate shops as well for Belgium is known for both of those products. Alas, the only thing we bought (other than food -- for we did buy chocolate but we ate it right then and there!) was . . . This plaque. 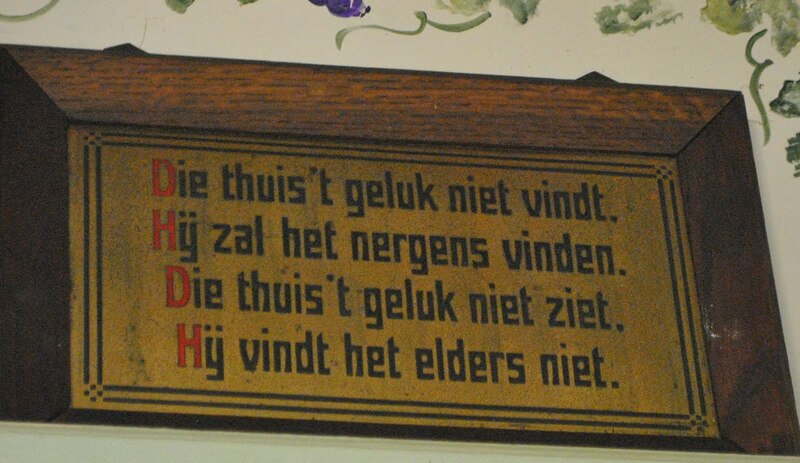 It is supposed to say something good about a house. 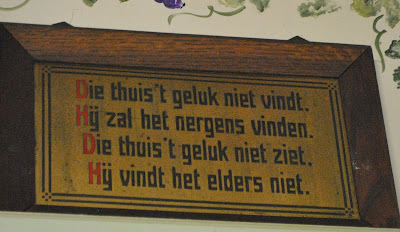 It must be in Flemish and we've never known what it said but it has always hung over the kitchen door at Linderhof. It's a perfect fit and is our own remembrance of a memorable day and my very first day in a European city. We did take the camera and took pictures -- lots of pictures but then something happened to the film (it was back in the days of film) and alas, our only memories of Bruges was the kitchen plaque . . . and our memories! And then, one year as a gift, friend Jean from Memphis sent me this lovely picture. Of Bruges. I framed it and it's always been on a tabletop or shelf in the living room. I adore the picture for it reminds me of a lovely day that we spent in Belgium. My only picture of that beautiful place! This lovely picture of Bruges. And it came home with me. 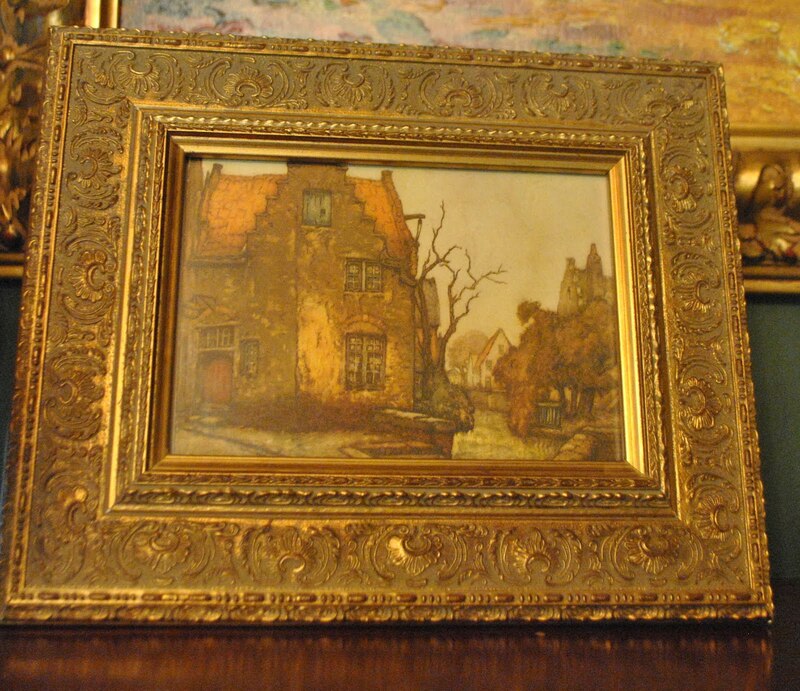 Our main bath has more wall space than most rooms of the house and we have the walls filled with watercolors and oils and etchings and engravings of places that we've been -- most were purchased over there and brought home with us. It makes me smile, to see the places we've been as I get ready for the day -- and although the walls are almost full I did have room for one more! And we don't have a remembrance of Bruges so it was perfect! But the best thing is the back of the picture . . . Most of it is in tact. 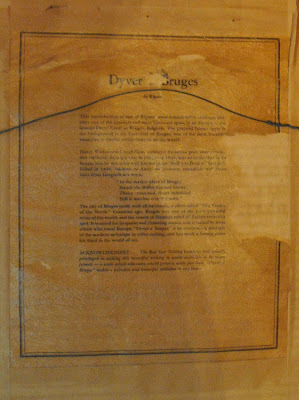 It is a copy but it is a signed and numbered copy. It was made for the customers of The Red Star Milling Company. It doesn't say if it was a "freebie" or something that the customers had to purchase. 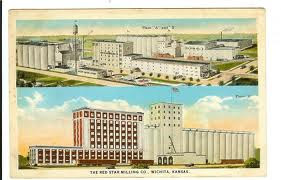 But the most interesting thing about the Red Star Milling Company is not that they reproduced that watercolor for customers (although I still don't know the date that it was done) but that it played a roll in something much bigger. 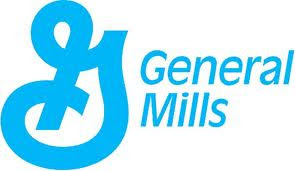 For in 1928, it became one of a group of mills which included Washburn, Crosby and Company (and all mills constructed or purchased by them) as well as the Royal Milling Company, Kalispell Flour Mills Company and the Rocky Mountain Elevator Company. The name of the new company? You've probably heard of it!!! And recognize their newer logo! 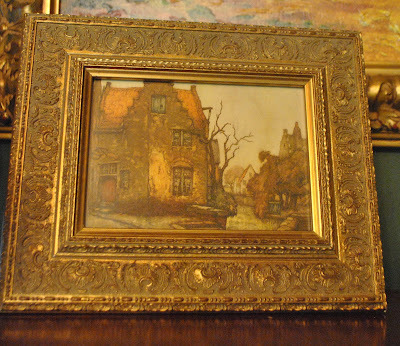 What's most interesting, to me, however, is that daughter Sarah works for General Mills and one of the original mills of the company is Red Star Milling Company and a picture that was made for their customers now hangs in the bathroom at Linderhof! Isn't that terrific! I'm joining Savy Southern Style for Wow It Wednesday. 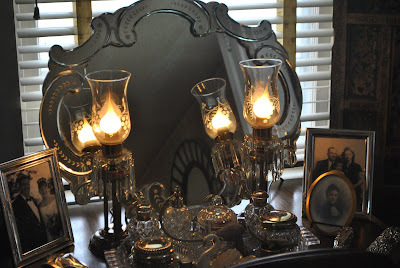 I bought these lovely lamps and placed them on the dining room mantle. And I liked them there . . .
Upstairs to my dressing table. And I think they are smashing -- even more smashing than they were in the dining room! 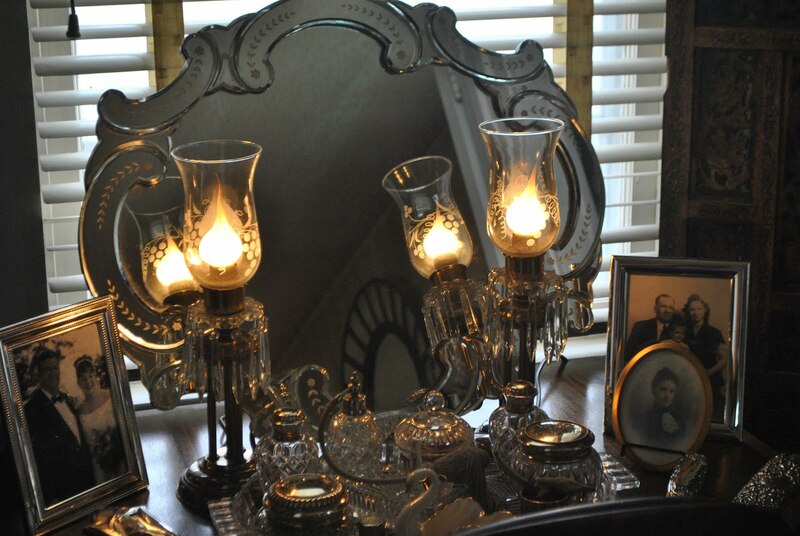 In front of my dressing table mirror, they are reflected and create four burning bulbs instead of two! A nice table -- but "nice" tables finish last. What one wants is a WOW table! Shopping in the city with friend Shirley Ann, we came across . . . 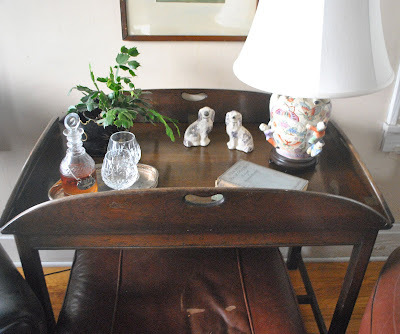 The "WOW" table -- an English Butler's table. A real English Butler's table -- for it does say "Made in England" on one of the legs! And it's end table height not coffee table height which does make it usable as a Butler's Table. It has the four sides that fold up like the coffee table ones and the hardware shows some nice age! 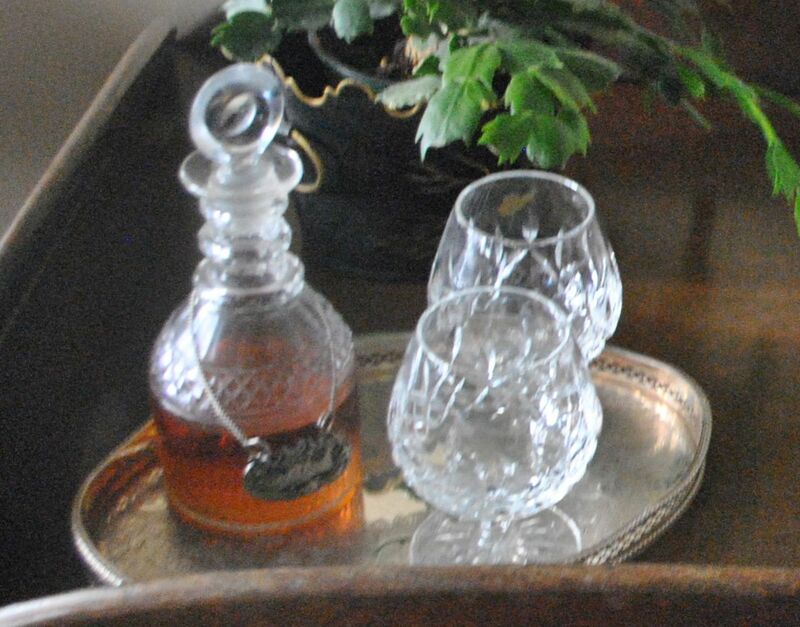 Our Georgian decanter which we bought on our first trip to England along with two Waterford brandy snifters -- all on a silver tray -- it's for bedtime nips! 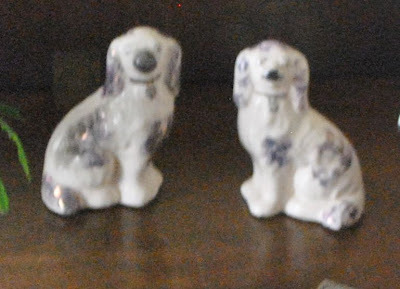 A pair of Staffordshire dogs. Bought at flea market eons ago. Supposedly they have some age on them but there are so many copies of these dogs out there that I don't know for sure. They're not terribly big which is why I bought them and seeing the picture I notice that they are not a mirror image for one dog's mask is bigger than the other which means that they must be hand painted. I've always loved them for their size as well as their color. 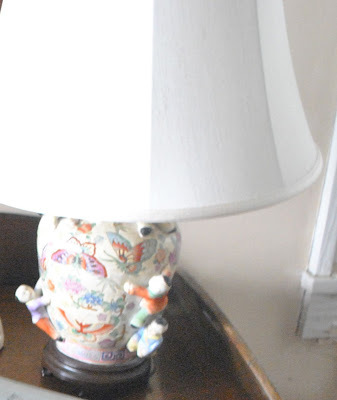 And a favorite lamp -- Asian with butterflies and little Chinese men trying to climb to the top. I got it at a favorite shop a long time ago at a steal! And I like it on the table -- it seems the perfect place for it! Wearing of the Green . . .
And After Dinner . . .
A Sunday Lunch or a Sunday Dinner? It Came In the Mail . . .